FREE SPIRIT: MED PG CET- SCRAPPED ?? I woke up that morning and was shocked to read this piece of news that within the next two years, PG CET is likely to be scrapped. The feeling of anger immediately took over me….I felt like being smothered and betrayed by the State Govt. Why is it that only DMER Maharashtra alone comes up with such heart braking ideas…..demoralise us as future doctors .CET is platform where all of medical aspirants are given a common platform to prove our worth. Is it the high percentage during UG, a certificate that we become a good doctors, or is it the application of what we learn in 4.5 years, in the CET exam that is a reflection of our education standards ? When everything was going fine, what is the need to take such drastic steps to crush our dreams. When I came to this profession chasing my dreams, little did I realize that I would need a long medical lineage, a surname or a Godfather to make them come true. Many of us find it difficult to put our answers in stories….scoring less marks….does that mean that we know less than our high % seekers ?? The Govt. thinks that this will make better MBBS doctors…true….Sir, but please understand that an MBBS does not stand anywhere today….we cannot survive in this competitive outside world ‘except in the villages’ without a post graduate degree…..No doctor will say that he came in this field for SOCIAL SERVICE…..MBBS is already long enough and the Govt. seems to be leaving no stone unturned to make matters worse….By the time we will finish SECURING a PG admission and COMPLETING that, we would all be bald or at least with grey hair. I can only say is that this move will only increase corruption to sell post graduate seats among Govt. Medical colleges too…..Beware private colleges, you will have competition in your business ! 51 % reservation-reluctantly acceptable, MO ship-we will manage (most of us do not have Rs.5 Lac to pay the Govt. just for 1 year…wished we had a salary like that….Thanks for the bait of Rs.1 Lac anyways…..But scrapping PG CET –not acceptable at all costs. I think its time that the medical fraternity and all students come together and oppose this INSANE move. WHAT ARE YOU WAITING FOR ? ?Be your own GODFATHER. 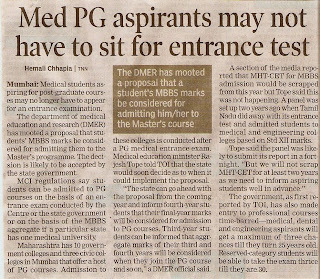 It is under consideration and they will have to inform all med studs b4 it is implemented. So be cool we'll pass out b4 the rule is applied.